It's Friday and you know what that means... Freebie Friday! :) Hope everyone has had a great short week -- and now on to the final piece of "The Hoosier State" kit, part 3! If you've not been following my blog the last few days then you've missed out on parts 1 and 2, so be sure to flip back and grab them so you can have all of the Indiana goodness at your fingertips. Part 3 is a bit 'cornier' than the previous two pieces and consists of the final two papers, some corn-y notepaper, two more kinds of corn elements, another peony and a wheat inspired mat, a little wordart and wooden elements, a new button and a handful of bows, an acrylic state of Indiana and two more ribbons, with one being of the hand-beaded variety. It's a beautiful final piece (if I do say so myself) and now your Hoosier state kit is all complete! 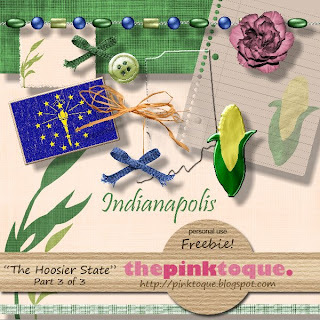 Download "The Hoosier State" Part 3 of 3 (final!) HERE. -The Ohiogander on behalf of the Hoosierganders!